It must get tiresome for black guitarists to be tagged as the “next Hendrix” with predictable regularity. Gary Clark Jr. is just the latest to receive this impossible and ridiculous comparison, including from the New York Times of all places. At best, the Hendrix comparison trotted out for every black rock guitarist is simply lazy, and at worst its subtlely racist. I suspect that a performer with the intelligence and grace exhibited by Gary Clark Jr. must sigh at the silliness of the tag, but also find it somewhat humorous at this point. We caught his excellent set on Saturday of Mountain Jam last month and the tongue in cheek acknowledgment of the comparison was a terrific run through Hendrix’s “Third Stone from the Sun” both as the intro and outro of Clark’s own “If You Love Me Like You Say”. In the seventy-five minute set, Gary Clark Jr. exhibited both the guitar chops and strong vocals that have earned him an enormous amount of authentic praise lately, too. He was selected to play at Eric Clapton’s 2013 Crossroads Festival, he performed with the Rolling Stones this Summer, and he even played at the White House for a Command Performace. When he next returns to the NYC area, it will be for a headline gig at the cavernous Terminal 5. I recorded this set in the same manner as the Govt Mule set from later in the day, and the sound is equally good. Enjoy! 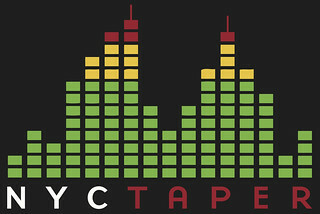 If you download this recording from NYCTaper, we expect that you will PLEASE SUPPORT Gary Clark Jr., visit his website, and purchase his official releases from the Store at the Warner site [HERE]. In the vocabulary of live Grateful Dead nomenclature, certain songs take on specific identities. Among the song labels are “jam vehicles” (“Dark Star”, “Playing in the Band”, “The Other One”) and then there were songs that were pejoratively described as “throwaways”. Among Jerry Garcia’s vices was a lazy streak. He neither wanted to play extended versions of songs he didn’t particularly like, nor did he enjoy playing complicated songs. One of the positive aspects of Phil Lesh’s live interpretation of the Grateful Dead catalog is that he corrects these two shortcomings. Phil and Friends do not play throwaways — every song played is given a full interpretation, and no song from the GD catalog no matter how difficult, is off limits. At Mountain Jam, the Phil and Friends set opened with a neat jam that segued effortlessly into “Cosmic Charlie”, a complicated and multi-layered song that the Dead retired in 1976 in large part because Garcia just didn’t want to have to play it. And former throwaways “Cold Rain and Snow”, “Midnight Hour”, and “Box of Rain” were given full workouts. Indeed, Cold Rain clocked in at nearly 20 minutes, five times longer than the standard GD version. 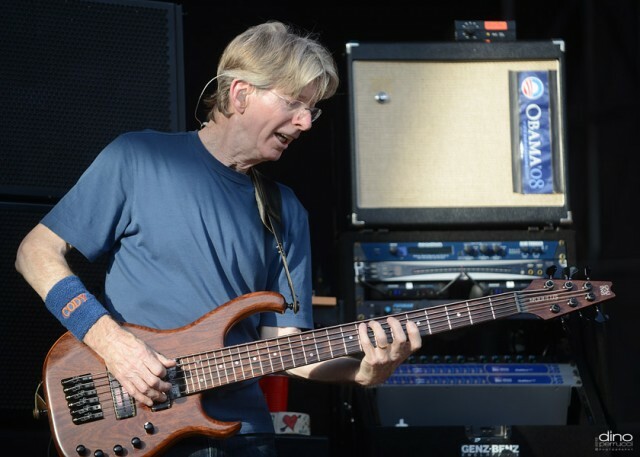 Even Lesh’s own composition “Unbroken Chain” (streaming below), played only a dozen or so times on the last Dead tour in a perfunctory manner, was extended to nearly twenty minutes. Each segment of the song offered the opportunity for the quintet to explore and with the addition of Warren Haynes to the band for this show only, the guitar work in Unbroken was simply stunning. The audience at a Phil and Friends show also definitely gets their money’s worth — this show clocks in at nearly four full hours of music. For a 73 year old band leader, that’s a pretty amazing feat. I recorded this set from the right side of the soundboard cage but otherwise in the same manner as the Govt Mule recording and the sound quality is excellent. Enjoy! Download the Complete show in MP3 and FLAC at Archive.org [HERE]. If you email nyctaper for access to this recording, we expect that you will PLEASE SUPPORT Phil Lesh and Friends, visit the website, and purchase the official releases at the dead.net Store [HERE]. When I first began going to Maxwell’s back some 25 years ago, it was to me just another of the excellent NYC-area clubs that hosted the bands I preferred. Its been the last decade where the club began to mean much more to me. While I was somewhat late to the Maxwell’s admiration party, it still hit me like a punch to the stomach when the news broke that the club would be closing for good at the end of July. In recent years as is well documented on the pages of this site, we’ve taken many trips over to Hoboken for some of the best shows I’ve seen in my entire life. The club became a home away from home — when I came in through the side door often much earlier than the time for doors, I was certain that I had a night of great music, good food, fine beer and welcome company ahead of me. Going to Maxwell’s was an escape of sorts, but more importantly it was about people — those that make a night of entertainment enjoyable in all aspects. The refreshing thing about Maxwell’s was that it was entirely free of the venue politics that plague many local venues. When I came in the door, I was welcome. And since I came so often, the staff were all familiar and friendly faces. I didn’t know all of their names, but every server, bartender, and bouncer were all the kind of people that you’d hope would run a music venue. Of particular note for me was Mike the ticket/door man who often allowed me to enter the venue early to set up equipment, and of course Carson Kopp, the venue’s head sound technician whose sound talents are well documented on this site but whose generosity, patience and sense of humor were always second to none. I expect that all of the people involved in this special place with land on their feet wherever they go, but somehow it will never be the same. A large reason why Maxwell’s was the locale for so many of the special nights we’ve experienced was the “house band” — Yo La Tengo. We’ve seen them at times other than Hanukkah, but the vast majority of our YLT shows were during the eight day holiday. 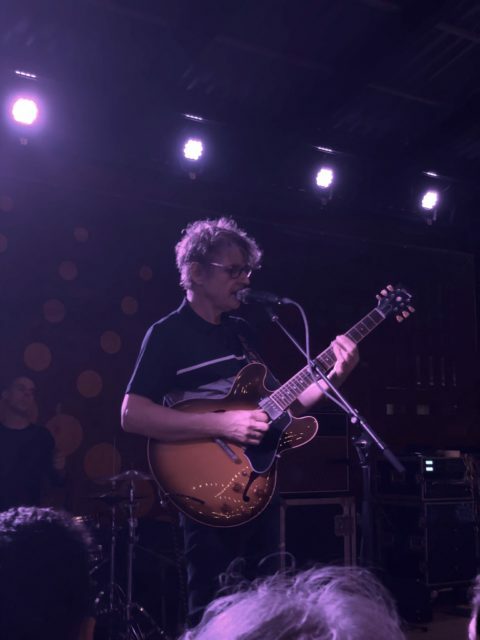 Due to some unforseen circumstances, on Saturday night a show originally billed as “Condo Fucks” in an opening slot became a two-set Yo La Tengo Maxwell’s show, and will be the final show of the band at its home venue. With that knowledge, the band’s entrance on stage in front of the red velvet curtain was instantly emotional. It was both hard to fathom and hard to accept that the band’s familiar position was its final night on this stage. Yo La Tengo has always had a keen awareness of its circumstances and its surroundings, and the setlist seemed uniquely fashioned for this night. Indeed, as “Mr. Tough” was dedicated to venue manager Todd Abramson, it occurred to me that the lyrics “we’ll forget about our problems / Ignore them for a little while / And leave our worries in the corner” quite well summarized the feeling of entering Maxwell’s for a night of music. While the weird sense of current enjoyment and the dread of the ending of something magical permeated my feelings throughout the set, it wasn’t until a beautiful quiet version of “Tom Courtenay” that the lump in my throat evolved into real tears. Its hard to lose something this special, but Yo La Tengo’s quiet first set was the cathartic remedy that we needed to help us accept our fate. After a break, the band returned with a full electric “Condo Fucks” set of garage-rock covers. It was exactly what was necessary at the exact right time — the chance to celebrate what Maxwell’s was really all about, no frills and unpretentious rock and roll simply for its own sake. The band’s final song, a super quiet and oh so appropriate cover of the Kinks’ “This Is Where I Belong” wasn’t so much a crying song as it was a wave goodbye. Ira Kaplan introduced the song by humbly noting that “this band does not exist without this club.” Indeed, much of the most important alternative rock of the last 30 years doesn’t either, and for that we can always thank and remember fondly Maxwell’s in Hoboken. I recorded this set in the manner we’ve always been lucky to be permitted to record in this venue, and the sound is excellent. Enjoy! Yo La Tengo is going to be on tour for the next several months and the dates are [HERE]. If you download this recording from NYCTaper, we expect that you will PLEASE SUPPORT Yo La Tengo, visit their website, and purchase their latest album Fade from Matador Records [HERE]. The Thermals signed to Saddle Creek Records in January and in April will release Desperate Ground, their first album in three years. This year also marks the 10th anniversary of the release of their outstanding debut album More Parts per Million. On their current tour, the Thermals are featuring hefty doses of each of the career bookend albums in the setlist. Last night at Maxwell’s, the band delivered an extremely energetic show to a raucous crowd. From the very first drum beat, the front half of the crowd were relentlessly dancing, moshing and reveling in the band’s high-speed performance. The Thermals played twenty-three songs in a little over an hour, almost without coming up for air. The band also showed their appreciation for the rabid fans in other ways. I saw bassist Kathy Foster in the hallway leading the venue taking much time before the show talking to the fans, signing albums, and generally just hanging. Throughout the set, Hutch Harris interacted with the crowd, played off-stage inside the audience, and did a few stage dives. And at the very end of the set, each band member hi-fived the entire front of the crowd and stuck around after the set to socialize. The Thermals are a band who seem to be having an absolute ball playing their music and the positivity is infectious. The band even took time to give a shoutout to the legendary John Agnello, who recorded their new album in New Jersey. The Thermals will play an afternoon set on Monday at the Ace Hotel in Manhattan before heading down to SXSW and then finishing up their tour on the West Coast, dates here. I recorded this set with the new Neumann TLM 102 large diaphragm cardioids mounted inside the soundboard cage and mixed with a fine feed from veteran Maxwell’s FOH Carson Kopp. The sound quality is superb. Enjoy! If you download this recording from NYCTaper, we expect that you will PLEASE SUPPORT The Thermals, visit their website, purchase their official releases from the Store at their website [HERE] and Pre-Order Desperate Ground from Saddle Creek Records [HERE]. The Beach Fossils self-titled first album was a refreshing debut from a band that had at that point been on our radar for a year. It was a well-received 80’s influenced indie-pop album that was fairly straightforward fun. But if you expected the band to make the same album over and over again, you’ll likely be disappointed in the new Beach Fossils album Clash The Truth. Dustin Payseur is a student of music — he’s both a collector of vast quantities of vintage vinyl and a sponge for knowledge. I’ve had both conversations about obscure 80’s music with Dustin and seen the incredible list of songs on his laptop. This is a performer who knows his craft and understands its history. So it should really come as no surprise that Clash is a more mature and focused album than its predecessor. And as with much of the early 80s Brit post-punk that influences this album, it also has a bit of sneer. Fortunately though, much of the band’s fan base seems to understand and accept the band’s admirable growth. On Saturday night, Beach Fossils sold out Bowery Ballroom and delivered a performance that featured much of Clash and a healthy dose of older material. Dustin has integrated two new members into the band and the new material is just gathering momentum live, but overall the band delivered a solid set with many highlights. Beach Fossils are on tour in the East but return to NYC for a show at 285 Kent this Sunday, March 3. I recorded this set with my new Neumann TLM-102 large diaphragm cardioid microphones from our usual spot in this venue, and mixed with a fine board feed. The sound is excellent. Enjoy! If you download this recording from NYCTaper, we expect that you will PLEASE SUPPORT Beach Fossils, visit their Facebook page, and purchase Clash The Truth from Captured Tracks [HERE].